So you’ve practiced your quilling coils, made tons of teardrops and paper squares… and you’re ready to learn something new! 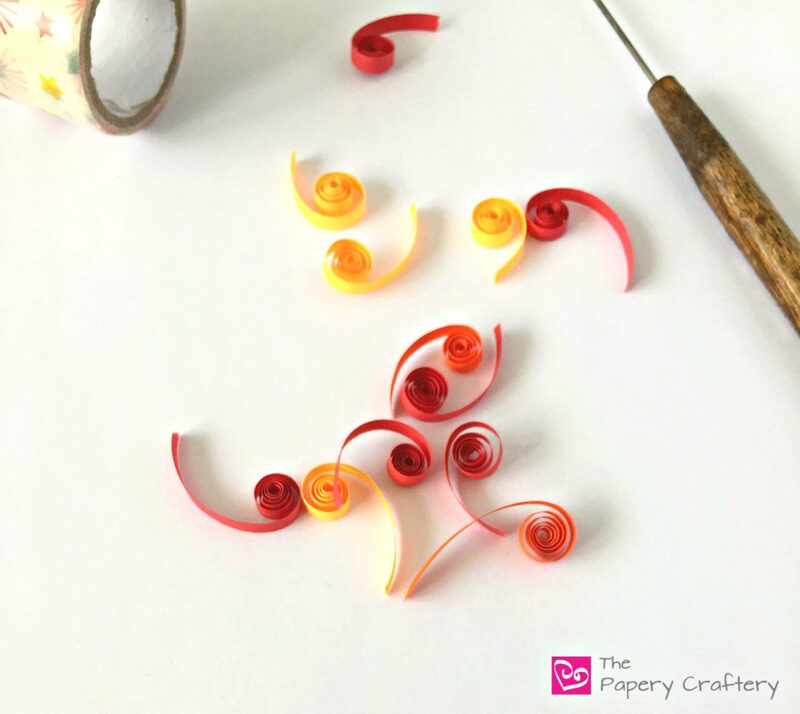 Let’s continue on this quilling paper journey and talk about how to make quilling paper scrolls! Most often, quilling paper scrolls is simply a matter of rolling a coil, but leaving a little unrolled tail on the end. Take the scroll off your quilling tool, and that’s it! Easy as pie! Of course, there are a few different types of more advanced scrolls, too! For a heart scroll, start with a length of quilling paper folded in two. Roll each end inwards towards the center fold. How far down you roll depends on your use, but try to keep both sides even. I demonstrated a variable of this scroll in my tutorial of 4 different hearts from last year. A V scroll starts with a folded strip of paper, too. This time, instead of rolling into the center, you will roll both sides to the outside. Roll each end towards the center of a paper strip, again trying to keep the coils an even size. The result is a scroll that looks like the letter C.
And, lastly, an S scroll. This one will look like…. you guessed it, a letter S! Roll one end of a strip into a coil. Remove tool, and flip the strip over. Roll another coil from the other end towards the center. Get some practice and make some variables! By changing up the length of the strips and size of the coils on your scrolls, you can create a bunch of different shapes! Quilling paper scrolls are ideal for adding simple filigree to flower projects. Or use them to fill in spaces in the more open, contemporary quilling style! Just like most quilling techniques, the possibilities are endless! Print out a copy of my scroll worksheet so you can practice and have a reference of all the scroll shapes. Leave a comment below and tell me how you’re going to use your scrolls! And, as always, happy quilling! I’ve always wanted to try quilling, I think it’s so beautiful! Thanks for the tutorial! I hope you do, Amy! Thanks for stopping by! Todo es muy hermoso .Gracias por compartir estas técnicas. Eres muy bienvenido. ¡Espero que los encuentres útiles!